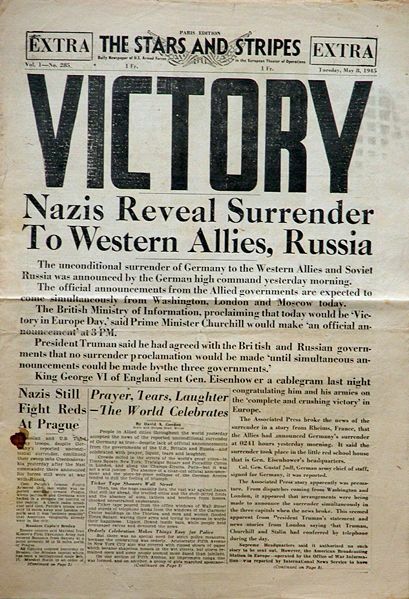 Tomorrow, May 8, is V-E Day. Or today is, depending on how you choose to do the math. I am old enough to remember when V-E Day was still a fairly big deal. Even in the early 1990s, long after I had reached full adulthood, the anniversary of the German surrender was duly noted. No one mentioned it to me today, and I am not betting on it for tomorrow either. What can you say? The world moves on. I mentioned last year on December 7th that Pearl Harbor Day 2011 was the last WW2 anniversary I would mark the way I once did. The reason for confusion over the official ending of the war in Europe has its roots in the earliest stages of the Cold War. The Germans surrendered to the Americans on May 7th, but Stalin wanted to wait another day to make it official with his own ceremony. American and British reporters were sworn to silence, and so everyone waited. The plan was foiled when the Germans announced over the radio that they had indeed capitulated. After they did so, Ed Kennedy of the Associated Press realized the hoodwink for what it was and told the world what leaders in Washington, London, Berlin, and Moscow already knew. For his troubles he was unceremoniously fired. I was having a conversation about this affair with someone the other day, trying to figure out why the Allies, especially the U.S., felt so beholden to Stalin. My theory is that Roosevelt never fully understood who and what Stalin was, and believed he could use his considerable personal skills to “handle” the Russian leader. Roosevelt was dead by May, however, and that does not explain all the kowtowing coming from his replacement. My speculation here is that the Truman Administration felt they owed the Soviets for their considerable contribution to victory, not to mention that they easily could have gotten back in their T-34s and rolled all the way through Western Europe if they had chosen. It all may or may not have been necessary but it was certainly a tragedy. Kennedy’s posthumous memoir has just been released. It includes an introduction and apology from the current AP president and CEO.